When you think of a classic outdoor game, what comes to mind? Do you think of pieces of chalk ground to dust after constructing an epic game of hopscotch? Maybe you remember impressive hacky sack skills during recess. When we consider a game that spans generations, crosses cultural boundaries, and can begin with a simple tap, we think of tag. The traditional “You’re it!” game is a staple in gym classes, playgrounds, and neighbourhoods everywhere, and requires minimal (if any) equipment or set-up to play. 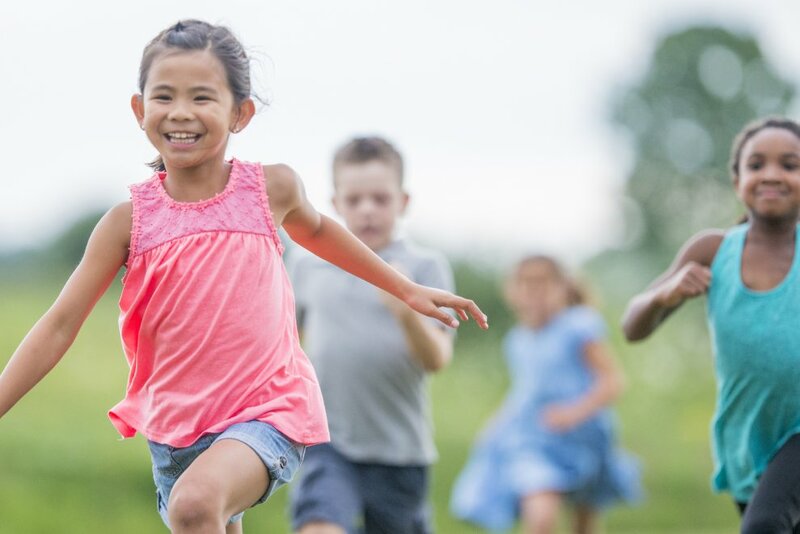 From a physical literacy perspective, tag is wonderful for developing fundamental movement skills like running, dodging, and stopping … to name just a few. But if you or your kids have ever wanted to jazz up this simple sport, here are some ideas and variations of the cool classic. In this version of the classic game, all players can tag and be tagged. Once a person is tagged, he or she must put one hand on the spot they were touched to make a bandaid. Tagged again? Make a second bandaid with the other hand and continue to run. If a player is tagged for the third time, they must visit the “hospital” — a designated spot outside of the boundaries — and complete ten jumping jacks to heal and rejoin the game. This delicious deviation from the classic starts with one person designated as “it”. When a player is tagged, he or she must lay flat on the floor with hands by their side and legs together, as if they were a hot dog. To get back into the game, two free players need to lie on either side of the “hot dog” to form the buns. The person who is “it” cannot tag any of the three players completing the hot dog, as they are allowed to join back in. Decide on one person to be “it” in a large boundary. When a person gets tagged, they become a “dead ant” by lying on their back with legs and arms in the air. In order for the “dead ant” to join back in, he or she must be tagged on each limb by four different people. When a player becomes a “dead ant” for the third time — we’ll call it “ant years” — they take over as “it”. In this large group game of tag one person begins as “it”. As other players get tagged, they link arms with the person chosen to be “it” and form a chain. The chain of people must work together and communicate as they try to tag the remaining players. The last player to get tagged is the winner and a new game can begin. This ocean odyssey requires two clearly-marked end zones and edges to form a boundary. One person is elected to be “it” and act as the “octopus”. To begin, the “octopus” is positioned in the middle of the area and the other players line up along one end zone. When the “octopus” shouts “Go!” all players attempt to cross the area to the other end zone without getting tagged. If tagged, he or she becomes “seaweed” and sits still at the position of contact. “Seaweed” may assist the “octopus” by waving their arms and tagging other players. In this sport hybrid, two players are designated as “it” and each have a soccer ball at their feet. To tag someone, he or she must kick a ball at the feet of another player. If the ball makes contact with somebody’s feet, that person gets a ball of their own and joins as “it”. The last remaining player to be tagged by a ball is the winner. NOTE: Be sure to demonstrate a safe and acceptable method of tagging. This variety of tag is popular in Pakistan and its name roughly translates to “up and down”. After choosing a person to be “it”, other players are only safe when their feet are not touching the ground. Whether players choose a tree, rock, or the front porch, they must find safety above sea level. Have you ever wondered what it would be like to play tag underwater? In this cool pool option, the player who is chosen to be “it” stands on the deck (the “diver”) while the others wait at the near wall in the water (the “swimmer”). After everyone inside the pool chooses a secret colour, the “it” player may begin rhyming off a range of rainbow hues. When a swimmer hears his or her colour called, they must attempt to swim to the other end of the pool without being detected and tagged by the diver. In-pool participants may attempt to deceive the diver but all swimmers must go within ten seconds of hearing their colour. Be sure to provide proper supervision and enforce safe conduct while swimming. To prepare for this zany zoo game, mark four different areas as “cages” and decide on one person to be “it” (the “zookeeper”). Divide the remaining players into four groups and designate one person to play the part of the “monkey” — the mischievous player whose role it is to free the others from the cages. Each group chooses an animal and a movement for the game, i.e. kangaroos can hop, cheetahs can run, horses can gallop, etc. To begin, the animals are set free to move around, but if tagged must return to their respective cage. While the zookeeper is trying to lock up all the animals, the monkey is letting everyone loose! I’m getting tired of fights everyday so thanks for the games they can play I’m trying some of the games today at Lunch. Thanks for the ideas! This will help my family choose a game to play together. Thank you for the ideals on “Tag”, its going to help a 5th grade group of boys that tend to argue everyday at recess because someone changes the rules and it’s always the same person who’s it.